Nothing compares to sharing the warmth and beauty of a fire. Now you can enjoy all that with none of the hauling, soot and ashes. That’s what a fire is meant to be! We supply and install Real-Fyre Gas Logs by RH Peterson. For over 50 years, Real-Fyre Gas Logs have provided a natural wood-like fire with maximum ease, efficiency and economy. Real-Fyre Gas Logs are manufactured to exacting specifications and the highest standards. 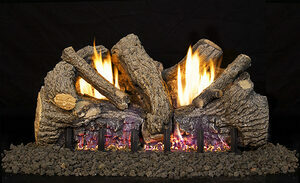 All Real-Fyre log sets are detailed with high definition bark and natural colors for authentic wood realism. Many also have hand-painted highlights that match nature’s beauty and variety. Real-Fyre Gas Logs burn cleaner than smoke-producing firewood, reducing pollution. Their beauty and warmth provide comfort and pleasure for as long as you own your home. Choose from a wide selection of the most beautiful looking gas fire products available, designed for externally vented fireplaces (chimneys). Real Fyre traditional vented gas logs are hand crafted and hand painted to be incredibly realistic, and equally beautiful with or without a fire burning. Shown: Designer Cedar. Authentic bark texture and log coloring...some logs are hand painted and detailed. Includes safety pilot control valve. Steel rod reinforced ceramic logs. No more messy ash clean up or carrying dirty firewood through your home. No dangerous flying sparks or creosote build-up. Choose from Charred Series, Designer Series, Classic Series as well as Large, Small, and See-thru Sets Series. Add Glass Gems, Diamond Nuggets, River Rocks, or Geo Shapes. Sizes range from 16 inches to 60 inches. Choose from a wide selection of the most beautiful looking gas fire products available, designed for externally vented fireplaces (chimneys). Real Fyre Traditional Vent-Free Gas Logs are hand crafted and hand painted to be incredibly realistic, and equally beautiful with or without a fire burning. Uses a minimum of gas offering money-saving fuel efficiency. Includes an Oxygen Depletion Sensor (ODS) for safe un-vented operation. Available in variable flame heights, manual control or remote ready. Also available in a reduced BTU, See-Thru, manual control, and/or remote ready models. Choose from Contemporary Series (G-21) Foothill Oak Series (G-19), Evening Fyre Series (G-18), Charred Series (G-10), Golden Oak Series (G-9), and Valley Oak Series (G-8). Add decorative accessories including realistic acorns, pine cones, wood chips, and oak branches. Sizes range from 16 inches to 30 inches. Real Fyre offers a range of burner designs and BTU levels for vented and vent-free gas logs. Vented Burners include: G-8, G-22, G-31, G-45, G-46, G-52, Epic Burner. Vent-Free Burners include: G-8, G-9, G-10, G-18, G-19, G-21 Contemporary Series. I have included some of the burners in Our Photo Gallery. If you would like more information on these burners please go to the RH Peterson Real Fyre Burner Collection. Don't see your town? Call us. We will be happy to service you if possible!